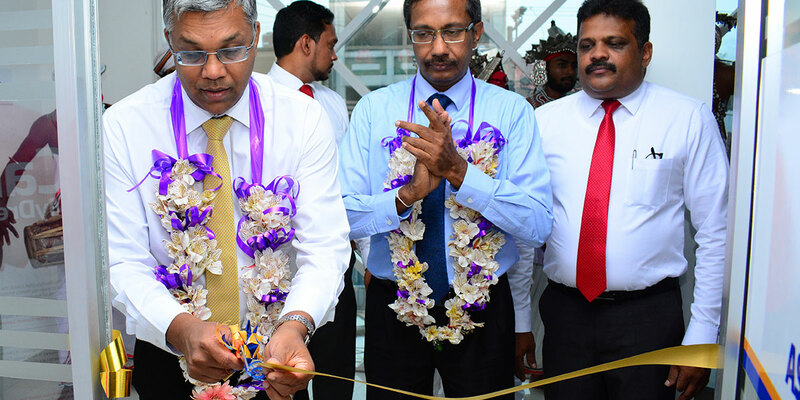 HNB Assurance PLC (HNBA) and its fully owned subsidiary HNB General Insurance Limited (HNBGI) relocated the Rathnapura Branch to a new business premises. The newly relocated branch offers an array of Insurance products interwoven with an excellent customer service. The branch includes a spacious atmosphere together with ample parking in order to enhance customer experience and the convenience of obtaining our insurance solutions. Sharing his views, Chief Operating Officer of HNBA Mr. Prasantha Fernando stated “customer convenience has been a key strategic focus of the Company and we have taken several measures to expand and upgrade our branch network in order to provide convenience and easy access to our growing customer base. Our branch network expansion will continue as it is pivotal to the growth and development of the business”. Chief Business Officer of HNBGI Mr. Jude Benjamin expressed his views stating “as HNBA and HNBGI continue to honor the unwavering commitment to deliver service excellence to its customer base, branch expansions and relocations ensure a more convenient and a customer-centric approach and we will continue to offer a vibrant range of Life and General Insurance solutions through our expertise and capabilities”. HNB Assurance PLC (HNBA) is one of the fastest growing Insurance Companies in Sri Lanka with a network of 59 branches. HNBA is a Life Insurance company with a rating of A (lka) by Fitch Ratings Lanka for “National Insurer Financial Strength Rating” and “National Long- term Rating”. Following the introduction of the segregation rules by the Insurance Regulator, HNB General Insurance Limited (HNBGI) was created and commenced its operations in January 2015; HNBGI continues to specialize in motor, non-motor and Takaful insurance solutions and is a fully owned subsidiary of HNB Assurance PLC. HNBA is rated within the Top 100 Brands and Top 100 companies in Sri Lanka by LMD and HNB Assurance has won International awards for Brand Excellence, Digital Marketing and HR Excellence and also won many awards for its Annual Reports at the Award ceremonies organized by the Institute of Chartered Accountants of Sri Lanka and SAFA (South Asian Federation of Accountants).